Pelletier Rug and Floor has been offering braided rugs since 1957! A braided rug warms this room. 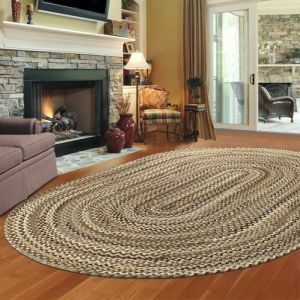 Braided rugs are an old colonial craft product. They are one of our earliest "green" products, because they were made from recycled cloth that was reused from worn clothing. They were traditionally made in the home for the maker's own use. Today, braided rugs are made with all new materials. They also come in sharp colors that match today's fabrics. They are perfect for rooms where our decor will benefit from a "home-spun" or colonial look. Nothing says "take me back in time" like a braided rug. There are three main types of braided rugs: cloth braids, yarn braids, and tube braids. 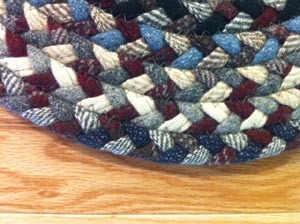 Detail of a braided rug made from cloth. Cloth braided rugs are your highest quality braided rugs. They are made with strips of cloth that are sewn together and then braided. The finished braids of cloth are then sewn together. Cloth braided rugs resist fuzzing and pilling much more than other styles of braided rugs. But because cloth costs more than yarn, they are also the most expensive. 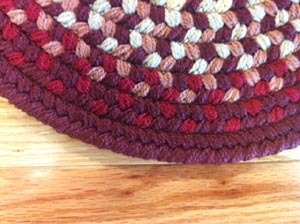 Detail of a braided rug made from yarn. Yarn braids are braided from yarn. Cloth is more durable than yarn, as it resists fuzzing and pilling. That having been said, yarn braids are still the most popular braided rug today because they are more affordable than cloth braids. You can often replace a yarn braid one or two times for the same money as a cloth braided rug. The third main type of braid is called a tube braid. Tube braids are made by sewing together tubes of loose woven material in concentric ovals (or squares). They are technically not braided, but look like braided rugs when glanced casually. Tube braids are the cheapest braid you can buy. Their main criticism is poor appearance. Stop by today to view our collection of braided rugs. We are bound to have a color you want.